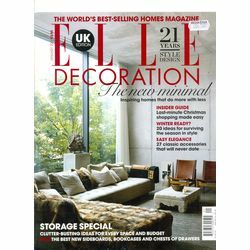 A subscription to ELLE Decoration magazine brings you the worlds biggest-selling homes magazine. Inspirational, informative, stylish, useful and beautiful. ELLE decoration magazine is where style lives. It is the ultimate guide to decorating and design and a subscription to ELLE Decoration magazine is the indispensable must-have source for anyone who wants to create a more beautiful life.